NOTE: There is no official word on the details of Fr. Bob Haux's funeral arrangements. I will post it on this blog as soon as it is available; check back often. My first reaction after hearing of the passing of our beloved friend, Fr. Robert Haux, was to delay posting for awhile in respect of the situation. However, one of the last conversations I had with Fr. Bob was about the importance of NHA obtaining a compound. He firmly believed it beneficial for people (especially college students)to have the opportunity to experience life in a 3rd world country; that they should see for themselves what our pictures only hint at. "It will change their lives", he said. He lamented that "if my health was better" he'd go there with us in a New York minute. What Fr. Bob must not have realized is that with every DVD Movie he sent to St. Laurence House, with every rosary he sent(he sent thousands), with every tee-shirt in which he made iron-on decals, with every contribution- Fr. Bob was rendered present. He is at St. Laurence House in every way. Fr. Bob understood the need for NHA staff to be housed. "They are running themselves ragged caring for the poor and the sick. How can we not provide a house for them?" He wanted the dying to have a place to meet their final rest with dignity and comfort, not alone on the side of a road. He and I talked about the future of Nazareth House meeting the needs of the poor...and how that depended on us obtaining the compound - A center of operations and so much more- a place on the ground- in the area in which we serve. Neither Fr. Bob or I came up with any answers as to how to make it happen, how to raise the money...we just know that it must be done. He and I agreed to make it a project we would work on together. I know Bob's+ still working on it with me; therefore I can only push ahead to bring it to fruition, knowing I have him in the arena (cloud of witnesses) cheering me on. 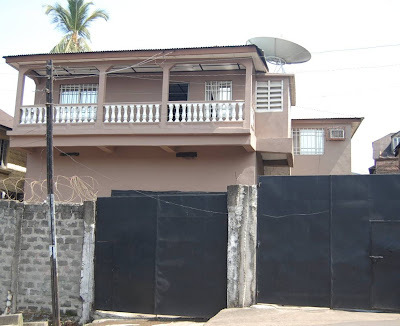 Finding proper facilities is getting more difficult as more and more property in Sierra Leone is being sold to foreigners hoping to promote tourism and make big profits. 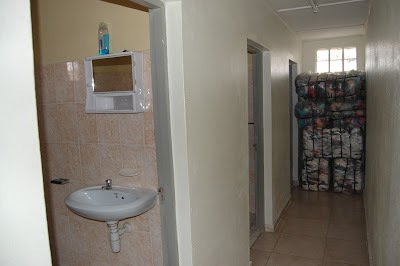 One of the first things that attracted Nazareth House to this particular compound is that it contains several built-in safety factors. 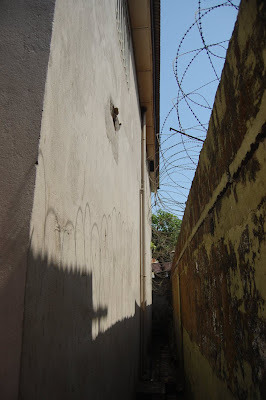 The photo below shows the Barbed Wired Concrete Wall around the compound. Our staff, the terminally ill patients of Lazarus House, and the guests we bring over to experience, first hand, life on the mission field MOST be protected. The full view of the compound shows the iron gate and wall of security. The bottom floor contains a adequate storage area for medical & pharmaceutical supplies, food (rice) for distribution, various humanitarian needs as well as a separate garage for a vehicle. 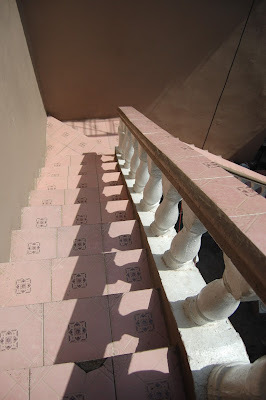 Travel up these stairs to the living quarters for the staff, the guests from overseas, and for the terminally ill. 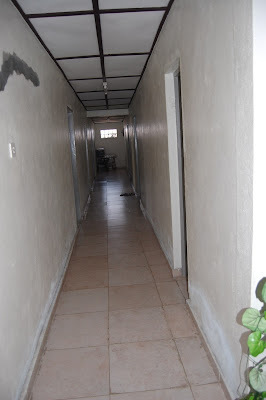 This second floor entrance allows extra security and exempts us from flooding during the annual heavy rains. 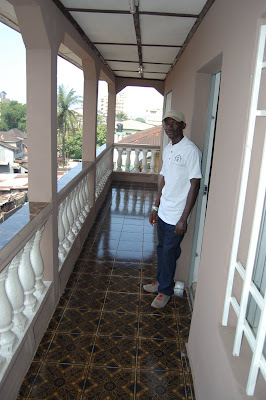 James stands on the porch which offers a view over the city and the ocean in the distance. Notice the beautiful tile floor (a signature of Sierra Leone where the tile is made). The compound is located in the midst of the city, in the midst of poverty and as an added bonus it is across from a small elementary school. 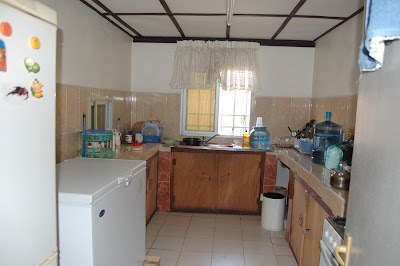 The kitchen is adequate and can accommodate the large amount of cooking we can do to fill hungry mouths. One hallway contains three bathrooms, one after another - this is helpful especially during a full house. There is also a hallway of bedrooms. 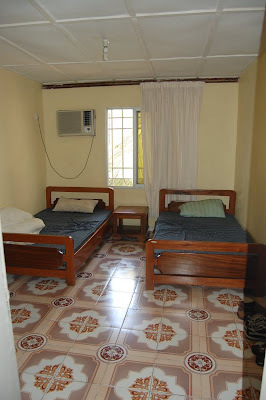 Each bedroom can accommodate two twins or a double bed. I noticed air conditioners throughout the house, I assume they would stay, however, I can't see them being used - only when we have guests from overseas (if then). James and Kadijah tend to put on fir-lined parkas and their teeth begin to chatter when the temperature drops to below 85 degrees. There is a water tower built onto the house which is a big plus. The owner is asking $250,000. We are accepting all donations no matter how small or large. 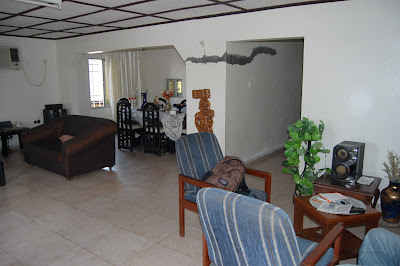 March 1, 2009, our current lease ends and we must vacate the premises of the present St. Laurence House.